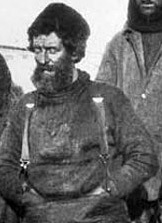 Thomas McLeod was one of the older and most experienced members of the Endurance crew, having been a sailor for 27 years when enlisted. 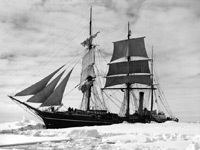 He had been at sea since he was 14 years old and had already been to the Antarctic with Scott aboard the Terra Nova, and would go on to join Shackleton's Quest expedition also. He was one of the few able seamen to hold two Polar Medals - one from the Terra Nova expedition and one from the Endurance expedition. "I weighed around 200 lbs when the Endurance sank, and went down to around 100 lbs before being rescued from Elephant Island." "Were you aware that Thomas being a good Presbyterian retrieved the bible, presented to the expedition by Queen Alexandra, when Shackleton threw it away, because he believed to throw away a Bible was a bad omen." "Some of my shipmates were down to see me off. What I always thought impossible happened. Old McLeod, one of the most hard-boiled sailors I ever ran across, started to blubber like a baby when I bade him goodbye." "a typical old deep-sea salt and growler"
Bakewell and McLeod lived out the later years of their lives quite near to each other in Canada, though neither was ever aware of it. The usual description of the arrival in the world of Thomas McLeod (or MacLeod) is that he was born at Stornoway on the Isle of Lewis, Outer Hebrides, Scotland, the son of a draper, John and Mary, the second eldest of four sons. The truth of him retrieving the Bible is well known but the Society has traced its whereabouts since the rescue from Elephant Island. See below. Tom was born, he said, in Stornoway on 3rd April 1873. But his birth record is to be found in Glasgow, not in Lewis. Like many young island girls, Barbara McLeod from Point Street had gone south to find employment in domestic service in the city. The 1871 census records her working in Garscube House in Maryhill. In 1873 she gave birth to a son at 11 Oxford Street, Tradeston. No father's name is recorded in the birth register, but 87 years later, on Tom's death certificate in Ontario, his parents are recorded as David and Barbara. The identity of his father is a mystery. Little Tommy McLeod was taken home to Stornoway to be brought up by his widowed grandmother in rooms above Murdo Macrae, cooper, at the corner of Point Street and Quay Lane. Having no siblings of his own, he regarded his Uncle Angus, just eleven years his senior, as his big brother. Angus got a job as a stable boy and later worked for many years as coachman to Doctor Murdoch Mackenzie. 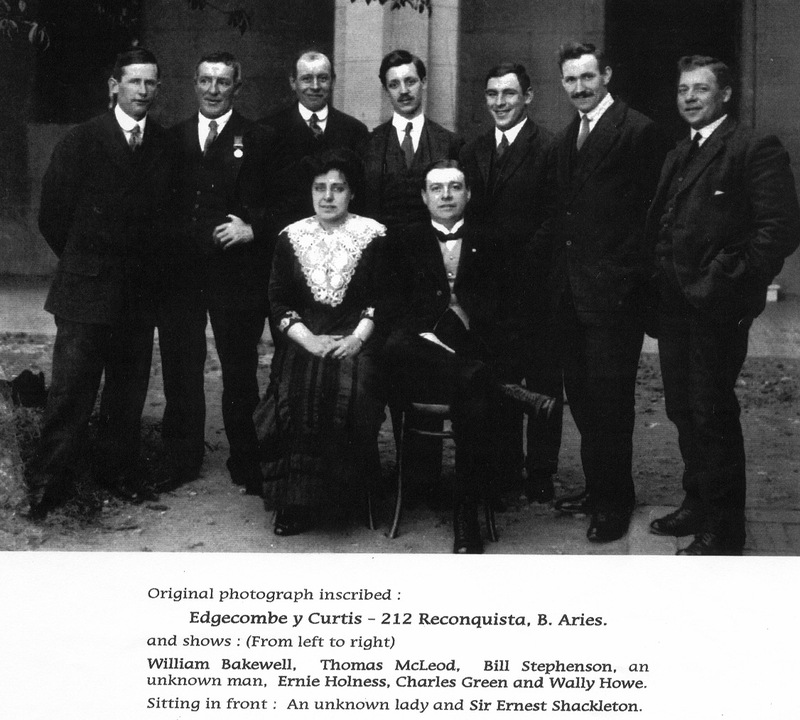 Dr. Mackenzie was the doctor who started the Lewis Hospital, Stornoway in 1896. The harbour was Tommy's playground and at the age of 13 he went to sea. He celebrated his 14th birthday across he world in Australia. By 1910 he was an experienced seaman. He had travelled the world, seen service in the Boer War, and had now decided to settle for a while in the Southern Hemisphere. Tom, and John Graham from Ness, Isle of Lewis, boarded the Terra Nova in Lyttleton Harbour, looking for work. There was only one position available and Tom got it. This was to be the first of three Antarctic adventures for the Stornoway seaman. On the return of the ill fated Scott Expedition in July 1913 Tom, along with his fellow seamen, was presented with the silver Polar medal by King George V in recognition of his service to Polar exploration. In Punta Arenas Tom was billeted with the McLean family. He showed his appreciation of their kindness by presenting them with the expedition's Bible on his departure. He wrote in the front, "To Mrs McLean from T. F. McLeod Trans. Ant. Expedition 13.9.16". In 1971 the McLeans' daughter passed the Bible to Commander Burley of the 1970-71 Joint Services expedition to Elephant Island who was giving a lecture in Buenos Aires. 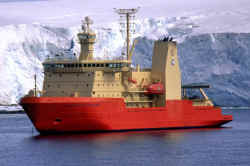 Burley forwarded it to the Royal Geographical Society where it is now held. 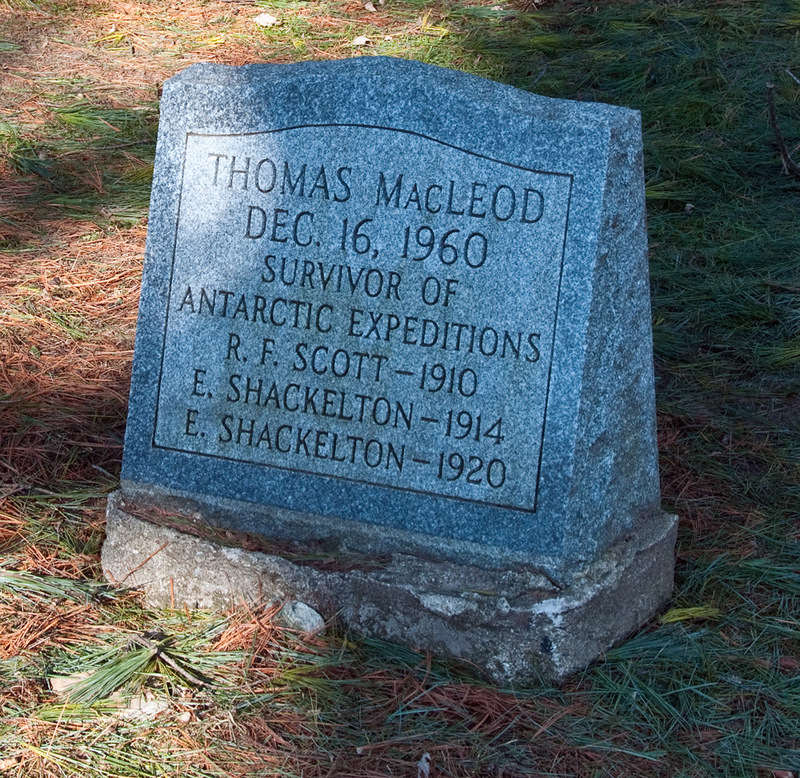 The missing leaves are in the possession of the Shackleton family. Little is known about the details of McLeod's life. He was a lifelong bachelor, in 1923 he emigrated to Canada where initially he was a fisherman off Bell's Island for two years. He was a school caretaker for ten years and then later a night watchman. He lived in Kingston, Ontario. In 1947 he moved again to Rideaucrest eventually passing away in the House of Providence, Montreal Street, Kingston, a retirement home, on the 16th of December 1960. 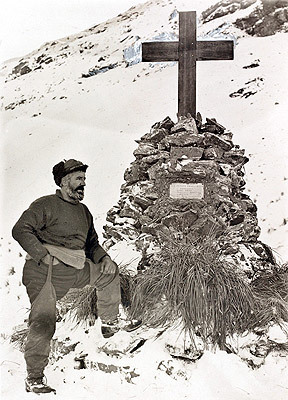 Though the records are not all in agreement, it seems that McLeod was 91 years old when he died, making him the oldest of the Endurance expeditioners, though not the last to pass away. He is buried Cataraqui Cemetery, Kingston, Canada. "It is amazing that Old Tom is wearing his Polar Medal because it means that he carried it with him all through the trauma of the sinking of the Endurance and the hell of Elephant Island." Thomas McLeod's Grave site at Cataraqui Cemetery in Kingston, Ontario, Canada. McLeod is an elderly Scotchman, a quaint old character. He was on the Discovery expedition. Food is our only means of exchange and we barter freely with it. For instance, the other day Hurley sold a pair of fur mitts to Macklin for cake of nut-food. McLeod exchanged a cake of nut-food with Blackborow for seven half penguin steaks, payable at the rate of half a steak daily at breakfast time. We remained in our bags all day and did not even go out for our customary hour's exercise. Some of the sailors are very reluctant to go out at times. Old McLeod sticks up in his stuffy bag all day long in the dark, quite contented to be left alone smoking or chewing. The others read a good deal, but he is almost illiterate, I believe.